In need of something warm, spicy and comforting as the nights draw in? Let me introduce the spicy tomato and lentil soup. Just as in July and August we were in un dated with courgettes that morphed into marrows because we couldn’t pick ‘em fast enough, now the green house is giving up its goodies. Tomatoes, tomatoes and more tomatoes – they keep on coming. Nice as they are to eat in salads, I needed a recipe that would use up a lot of them so I hit on tomato and lentil soup. Yes, there are lentils in it and they do contain carbs, but they thicken the soup up marvellously and make it so delicious, they are worth it. If you like your soup to be more of a main course than a starter, do as I always do and serve it topped with a poached egg or two. Some cooked chorizo would work too. Heat the oil in a large saucepan/stock pan. Add the onion and pepper and cook for five minutes, until softened but not browned. Add the tomatoes, garlic, cumin and chilli and cook for another five minutes until the tomatoes start to break down. Add the lentils and boiling water and bring to a boil. Turn down to a simmer and cover. Leave to cook for 15-20 minutes. Use a hand blender to puree the soup. Add salt to taste – you should be generous with the salt, as lentils can take quite a bit of it. 20g carbs and 5g fibre per serving. Don’t let your herbs go wild in the garden or get moldy in the refrigerator. There are lots of way to incorporate them into your recipes. A general guideline for using fresh herbs in a recipe is to use 3 times as much as you would use dried herbs. Wash herbs when you are ready to use them. Shake off moisture or spin dry in a salad spinner. Pat off any remaining moisture with clean paper towels. For most recipes, unless otherwise directed, mince herbs into tiny pieces. Chop with a chef’s knife on a cutting board or snip with a kitchen scissors. Unlike dried herbs, fresh herbs are usually added toward the end in cooked dishes to preserve their flavor. Fresh herbs can be stored in an open or a perforated plastic bag in your refrigerator for a few days. After washing, you can mince the herbs and place them halfway up in the sections of an ice-cube tray. Cover herbs with cold water and freeze until solid. Transfer the frozen cubes to a freezer bag. Drop them into soups, stews and sauces as needed. If you love a big, green salad, add fresh herbs to the mix. Add a big handful of fresh herbs to a basic mixture of equal parts sugar and water, bring to a boil, stir and then remove from the heat. Once completely cooled, strain out the herbs (discard) and use the simple syrup to sweeten iced coffee or tea and cocktails. Fresh herbs are a perfect in salad dressings and vinaigrettes. They round out the fatty and sharp flavors from the oil and vinegar. Combine finely chopped herbs and room-temperature butter to make a spread that compliments bread or cooked meat or vegetables. Heat the butter in a large saucepan or stockpot; add the garlic, celery and onion. Saute for 5 minutes. Add the squash and lightly salt the vegetables. Saute for an additional 5 minutes. Add the stock and 1 teaspoon salt, bring to a boil, reduce heat and partially cover and cook for 25 minutes. Puree the soup with a hand immersion blender until smooth. Taste and season with additional salt and pepper, if needed. Stir in lemon juice, corn and herbs. Simmer for 5 minutes. Serve in individual soup bowls topped with a tablespoon of sour cream. Allow 12-15g of net carbs per serving. 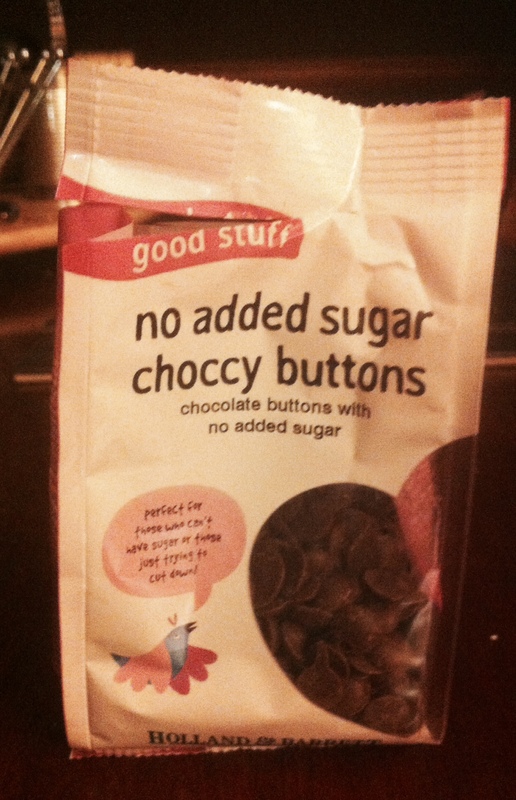 While perusing the shelves of Holland & Barrett recently (a hobby of mine), I discovered these no-sugar chocolate chips. It is a mistake to think you are going to get comparable results to traditional baking and cookies when you try de-carbed baking, but you will get something that might help add a little more variety to your diet. 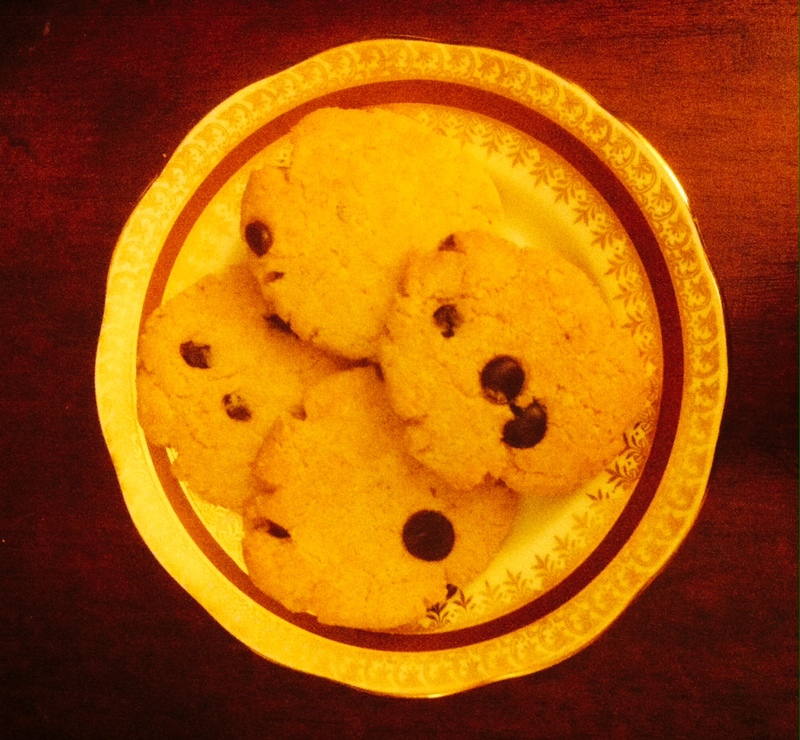 The recipe is also gluten-free so will please any coeliacs you know. I adapted this recipe slightly from one I found in the Low Carb High Fat diet book by Laura and Veronica Childs. Melt the butter in the microwave, allow to cool slightly and mix with the egg, sweetener and vanilla extract. Mix the ground almonds, bicarbonate of soda, Xanthan gum, coconut flour and the pinch of salt. Add the wet ingredients, the chocolate chips and mix well. You will get a sticky-ish dough. Divide the dough into 12 equal-sized balls and flatten out to a cookie shape. Place on a cookie sheet or baking tray and cook in the oven for 15-20 minutes, until they are golden brown. Cool for five minutes on the tray before removing to a wire rack and cooling completely. Each cookie has roughly 5g carbs and 3g fibre. Spirallising vegetables such as courgettes and squash to use instead of pasta is becoming mainstream thanks to popularisation by such celebrity cooks as Davina McCall, the Hemsley sisters and Ella Woodward. John Lewis says it was one of their best- selling kitchen gadgets of 2015. Now you can buy pre-spirallised vegetables in many supermarkets such as Tesco, Sainsbury, Marks and Spencer and Waitrose. From next month you will also be able to buy that good old low carb rice substitute cauliflower “rice” prepacked from Sainsbury. The interest is due to the growing demand from low carbers and those who are pursuing a wheat/gluten free diet. The restaurant chain Bella Pasta even serves vegetable “spaghetti” in their restaurants. Place water, coconut milk, broth, finely grated rind of lime, lime juice, chili paste, ginger and fish sauce in a large saucepan and bring to a boil. Add chicken and cook for 5 minutes. Cut Chinese cabbage into strips, slice the mushrooms. Chop the spring onions and chilli, add all to the pan, cook for 5 minutes. Add the prawns for a minute before the soup is ready. Just warm up, don’t boil them. Put half the chopped coriander in the soup and stir. Taste the soup. Maybe you want more zing? Then add a little extra sambal oelek. Bridget Jones jokes aside, turkey curry is now a current favourite of mine… It’s really easy to make, and relatively cheap too as turkey mince isn’t highly priced in supermarkets. 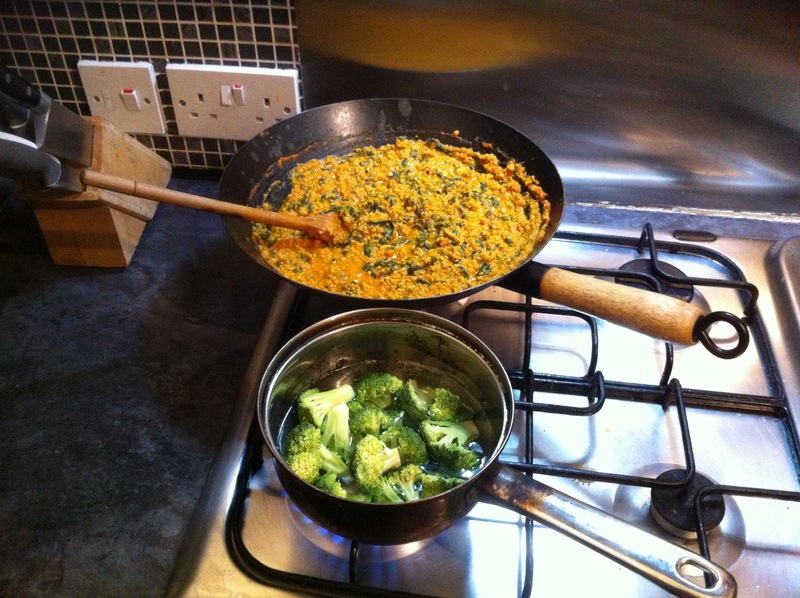 I like turkey curry served with broccoli or cauliflower (and if you really want a low-carb curry experience, you can make cauliflower rice, method here). The quantity makes four servings with about 20g of carbs per portion, 15g not including the fibre. Heat the coconut oil in a large saucepan or wok until hot. Add the onion and fry gently until translucent (about five minutes). Add the garlic and ginger, and cook for a minute or so before adding the tinned tomatoes and all of the spices. Chop the creamed coconut into small pieces and stir in. Mix well, bring to a simmer and leave to cook for 10 minutes, stirring from time to time. Now add the turkey mince and the frozen spinach and stir well to blend it all in. Mix well and bring back to a simmer. Allow to cook for 15 minutes. Serve with broccoli or cauliflower for added veggie goodness. If you have diabetes, you may well have fungal overgrowth problems (fungi loves a sugary atmosphere) and this dish has several anti-fungal ingredients – garlic, ginger and coconut oil. I found this recipe in this weeks Observer magazine. Of course the recipe was neither low carb or gluten free or even for muffins, but with a few tweaks I managed to produce these lovely muffins. Pre-heat the oven to 180 degrees. Gas mark 4. Melt the chocolate in the microwave and use a wooden chop stick to stir or melt in a bowl over simmering water on the hob. Mix the butter, sugar substitute, spice, essences, zest together until light and fluffy. Beat in the eggs and the almonds and chocolate till fully incorporated. This is most easily done one egg/ a few spoons of almonds at a time. Add the flour or extra almonds and baking powder. Either cook as a cake in a buttered/cake released springform cake tin or put into muffin cases for muffins. The muffins took 25 minutes and the recipe says the cake takes 30 minutes. Either way it is best to check your muffins at 20 minutes. Use a cocktail stick, special heat conduction stick (Lakeland Ltd) or your finger to check doneness. Sticks will come out dryish, the top will spring back when pressed with your finger when done). Serve with whipped double cream with a little vanilla essence.